Are you one of millions of workers, who have been working overtime without ever seeing a dime? Its a growing problem, especially among union workers because there is a misconception that overtime pay rights do not apply to them. This is because many union workers are often unaware of the Fair Labor Standards Act (FLSA) since the wage protections it offers are dealt with in the contract. However, members of the labor union are entitled to overtime pay at the rate set by the federal government and the state of Illinois. Our lawyers understand the complexity of overtime law and have built a solid reputation representing union workers in a variety of overtime claims. If you are a union employee, union leader, or shop steward and believe you have been a victim of wage violations, let us fight to protect your rights. Can Union Workers Waive Their Right to Overtime Pay? Trick and ploys are two common tactics employers often use to deny employees overtime pay.Employers often attempt to mislead union workers by telling them that they are not entitled to overtime pay due to a Collective Bargaining Agreement (CBA) or a Memorandum of Understanding (MOU). Neither a CBA nor an MOU permits an employer to violate the Fair Labor Standards Acts overtime pay provisions. A union contract, with some exceptions, does not trump the right to overtime pay established by federal wage and hour laws. If an employer states that overtime pay is required after 35 hours in a contract, then the contract would supersede the federal laws which require overtime pay after 40 hours in a single week. The federal labor laws on overtime pay set the minimum levels, and employers who wish to be more generous than the federal laws are permitted to do so.However, that is a rare situation. What we have witnessed during our employment law practice is employers who knowingly violate union workers overtime pay rights by skirting and violating state and federal overtime laws.If your employer is violating federal and Illinois overtime laws, you are entitled to file a lawsuit to reclaim all of your overtime pay. Goldberg Weisman Cairo labor union attorneys represent union workers whose employers have violated overtime laws. Union workers are entitled to equal distribution overtime. Employees who belong to a union are part of a unique group that already identifies themselves with labor rights as part of their labor union membership and affiliation. On the contrary, there are many conditions under which an employee who is entitled to overtime pay does not receive his or her pay.If you are ever uncertain about whether you are receiving your overtime pay and all of your wages, do not hesitate to consult with an experienced overtime pay labor union lawyer. At Goldberg Weisman Cairo, it has been our experience that when one union members overtime pay rights are violated, many other union members are similarly affected. Overtime pay and wage hour violations lawsuits allow us to represent large groups of hardworking union workers who have been affected by an unscrupulous employer.Additionally, the Fair Labor Standards Act (FLSA) requires the corrupt employer to pay all of the attorney fees and costs so that the union workers and the union do not have to pay just to receive their unpaid wages. 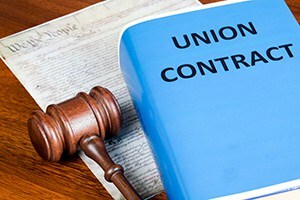 Unions dont need to rely on their own dues and funds to hire an attorney, GWC labor union attorneys review and handle cases on a contingency fee basis.A successful union worker overtime pay lawsuit can help right the wrongs that have been perpetuated by scheming employers.